but it all turned out all right in the end. This would’ve been up to the point just after Roger and Carole’s “nice ride in the country” in that comically-crappy 2CV: a sequence I found thrilling in 1986, but nowadays I watch wholly out of duty rather than love (a sentiment that can be extended to the entire full-length joyless borefest). 45 minutes was all I was allowed 25 years ago because it was the night before the start of the new school term. Click the image to see a full-size version, if you can bare to. What I can’t understand is why this ambitious project morphed, come mid-January, into an inventory of Children’s BBC Wednesday afternoon programming. Perhaps my diary will explain more nearer the time. Still, Mark Curry and George Lazenby: together at last. and we tied it to a tree to climb up it. catching my back on the ledge. I was winded for about 30 seconds. My mum was having tea with a neighbour at the time, and I well remember the embarrassment of stumbling into the kitchen, not entirely sure why I couldn’t breathe but knowing that something was badly wrong, yet having to still maintain a desperate pretence of dignity and politeness in front of our guest. I have my first lesson [after the summer] in a fortnight’s time. Today was a typical British day. from wind, wind, wind and even more wind. That’s me and my priorities, right there. Piano, rain, telly. And yes, I really did experience something of a frisson every time I saw an edition of Radio Times with the words NEW SEASON emblazoned diagonally across one corner. …Got wet at the City of Leicester Show in Abbey Park. It poured with rain, but nevertheless I got loads of Radio Leicester stuff. I also saw some presenters, including Tony Wadsworth. Said “facts” were of a thunderously academic if somewhat quirky bent. Want to know the only monarch to be buried in a coffin twice as wide as it was long? Anxious to discover just which metal has the highest melting point? Perhaps you’ve been fretting over the composition of Ohm’s Law? All the answers lay within*, along with information about unusual record breakers, the vital statistics of Rob Andrew and Annabel Croft, and career advice on how to become a hairdresser (“There are courses, from part-time to three-years full-time, at Polytechnics and Technical Colleges”). There were also lots of charts and forms to fill in, which was obviously of great appeal to my annotative tendencies. 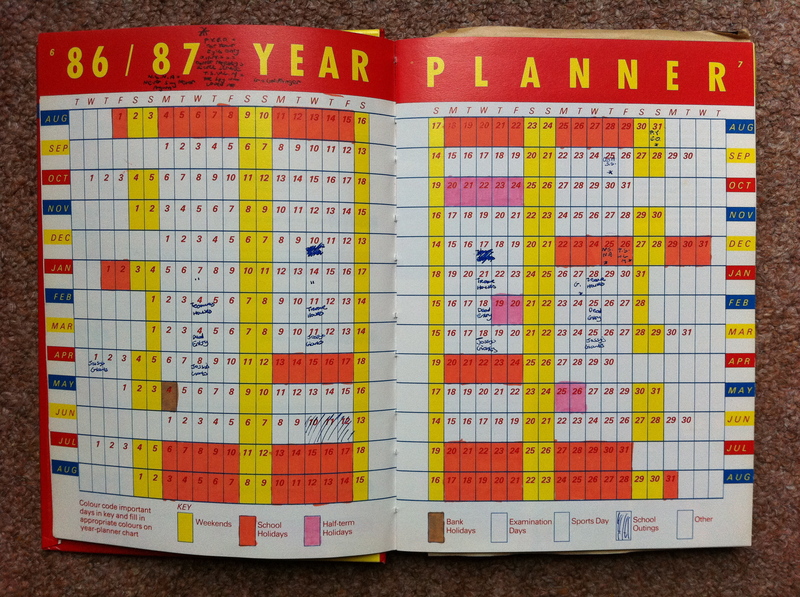 One of them, an 86/87 year planner, I tried to turn into a timetable showing every transmission time of a James Bond film on ITV, but lost interest halfway through and instead started noting each appearance in the BBC1 schedules of Jossy’s Giants. Look out for a reproduction of this grisly exhibit in a future entry. Meanwhile I celebrated my new diary with a trip to that enduring bank holiday staple, the county fair. The “stars” of Radio Leicester were in attendance; I remember helping myself variously to car stickers, spiral hats, picture postcards and “limited edition” biros. I genuinely thought this was ace. I’m not so sure, though, about the Dad’s Army film. I think I’m being sincere when I said it was “hilarious”, but my diary entries had begun to get a bit knowing, and maybe, just maybe, I was hazarding an attempt a bit of prematurely-adolescent sarcasm. Better that, surely, than prematurely-adolescent anything else. 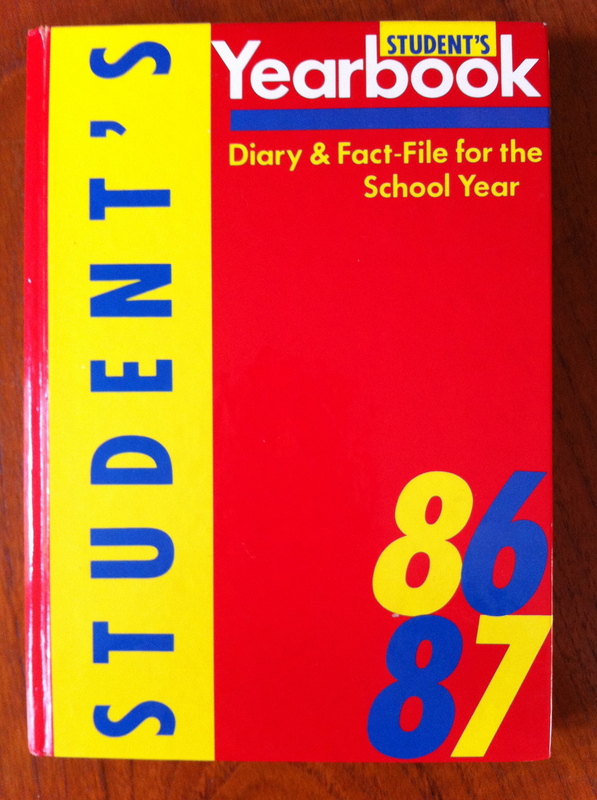 …This is the last entry in this diary because it’s the start of the academic year tomorrow. It was time to put aside the slim, pink and red-coloured journal that had seen me through the first eight months of 1986 and pick up a new volume, one that ran in step with the school year and hence demanded my attention from the August Bank Holiday onwards. I regretted having to abandon this particular diary with four months still to go. It didn’t seem right. It felt like unfinished business. It also helped to reinforce the impression in my mind of the impending return to school resembling the start of something new, rather than merely a continuation of what went before. If I’d have waited until Christmas and bought a new diary at the same time as the rest of the human race, none of this would have mattered. But I didn’t, and the novelty of putting pen to fresh paper triumphed over the convention of seeing things through to a proper conclusion.